One might have thought after the disastrous The Conqueror (1956), the ill-advised epic starring John Wayne as Mongolian warlord Genghis Khan, producers would have been reluctant to dip into that poisoned well a second time. 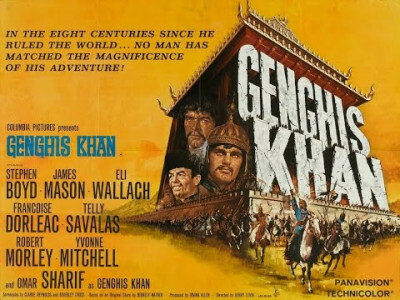 But, no, producer Irving Allen, having recently separated from producing partner Albert R. "Cubby" Broccoli and having some success on his own with another historical adventure, Jack Cardiff's The Long Ships (1964), decided an epic biopic of Genghis Khan was just the thing. The curious film that resulted, a British-Yugoslavian-West German-American co-production, is not unlike the hundreds of sword-and-sandal films cheaply made by European (especially Italian) companies riding the Hollywood vogue for historical epics. Its screenplay is depressingly familiar with no depth at all, and yet the picture is stuffed with important stars associated with recent epics: Omar Sharif (Lawrence of Arabia), Stephen Boyd (Ben-Hur), James Mason (The Fall of the Roman Empire), Woody Strode (Spartacus), etc. It's a colorful production with a reasonable quotient of epic action, but it's also justly largely forgotten - except for its jaw-droppingly awful casting. Twelfth-century Mongolia is divided into perpetually warring tribes. As a boy Prince Temujin, later Genghis Khan, sees his tribe captured by rival Merkits led by Jamuga (Stephen Boyd), forced to watch helpless as his father (apparently Omar Sharif) is ripped apart by horses, and the boy himself yoked with wagon wheel-sized collar resembling a colossal doughnut. As an adult Temujin (now played by Sharif) escapes with mute warrior Sengal (Woody Strode) and holy man Geen (Michael Hordern), infuriating the invariably seething Jamuga. Temujin is determined to unite the tribes of Mongol in order to conquer the rich kingdoms to the east and west. He quickly builds an army, and eventually kidnaps Jamuga's betrothed, Princess Bortei (Fran�oise Dorl�ac, her voice dubbed) and her three brothers, who become loyal lieutenants. The badly structured screenplay has Bortei captured and rescued by Temujin and his men, but not before he rapes and brands her. When she gives birth to a son Temujin claims him as his own, though everyone knows the truth. His growing army heads toward China, where en route they encounter a stranded Kam Ling (James Mason), official to the Court of Peking, who introduces Temujin to the Emperor of China (Robert Morley). The Chinese wealthy but weak in their defenses, effectively imprison Temujin and his men in a gilded cage. Each learns from the other, but soon Temujin becomes restless, anxious to return to the Mongol Empire to square off with Jamuga. Responsible for the screenplay were journeyman American TV Westerns writer Clarke Reynolds and Brit Beverley Cross, the latter best remembered today as the writer of three Ray Harryhausen fantasies, Jason and the Argonauts (1963) being the best of that bunch. But neither writes screenplays particularly well. Genghis Khan is clumsy and contradictory. The title character makes a big show of insisting captured female slaves be allowed to choose their husband or no man at all, yet he kidnaps Princess Bortei because she was nice to him once, and to spite Jamuga. She develops something like Stockholm Syndrome in her devotion to Temujin, who's barely less the sexist brute that his rival is. Temujin's magnanimity toward rival tribes hits a brick wall when dealing with Jamuga, and their test of wills becomes personal at the expense of Temujin's cause, a lack of good judgement on his part. Allegedly made for about $4.5 million, the money's up there on the screen, and in its defense Genghis Khan impresses because everything up on the screen is real and full-scale, not CGI generated trickery. The sets are big and impressive and the battling extras are many in number. Geoffrey Unsworth's Panavision lensing further enhances these qualities. But then there's the casting. One can forgive the lack of Asian faces insofar as Omar Sharif, Woody Strode, and Telly Savalas (lost in the crowd as a tribal leader) are concerned. They have malleable features that, like Yul Brynner, can fit a wide range of roles. But delicate French beauty Fran�oise Dorl�ac, freckly with alabaster skin and red hair, a Mongol? Blu-eyed Northern Irishman Stephen Boyd as a Merkit chieftain? Brooklyn-accented Eli Wallach, the son of Polish Jews, as the Shah of Khwarezm? The movie almost pulls this off in a wild confectionary sort of way until, about mid-point, James Mason's entrance prompts a James Finlayson-scale double-take. As bucktoothed, squinty-eyed Kam Ling, Mason is less authentic, more racially insensitive than Mickey Rooney's infamous Mr. Yunioshi, the outrageous Japanese caricature from Breakfast at Tiffany's. Mason's "no tickee, no washee" emoting is even odds as the "Worst-Ever Performance by a Great Actor." Others survive relatively unscathed. Busy character actor Michael Hordern miraculously maintains his dignity as the wise old medicine man and the film's narrator. Robert Morley, utterly ridiculous as the Emperor of China, took a much wiser if contrasting approach to Mason: he basically plays the usual Robert Morley screen persona, making no attempt to "act Chinese." Indeed, he comes off rather well in the end, playing an outwardly lazy and doddering despot who, in fact, is a cunning, pragmatic leader. Sharif does about as well playing the title character as is possible, given the limited ambitions of the script. He couldn't have been happy about the production, however. Incredibly, playing Genghis Khan he receives second billing in the cast, below Stephen Boyd. While he hadn't yet received top billing in a non-Egyptian film, Sharif is onscreen for nearly the entire picture, while Boyd's character is frequently absent for long stretches. Further, Sharif actually received less money starring in Genghis Khan than Eli Wallach, whose character is limited to two short sequences, got per week. Twilight Time's Blu-ray of Genghis Khan, filmed in Panavision and blown-up to 70mm in some European markets, good great, razor sharp most of the time with good color that shows the Yugoslavian locations to best advantage. (Fans of the Karl May Westerns filmed there will instantly recognize some of these.) The DTS-HD Master Audio 1.0 mono is fine, and supported by optional English subtitles. The disc is region-free and limited to 3,000 units. Supplements are limited to an isolated music and effects track, an original trailer, and liner notes by Julie Kirgo. Worth seeing for its spectacle, and the spectacle several actors make of themselves agreeing to appear in it, Genghis Khan is Recommended for fans of such pictures.